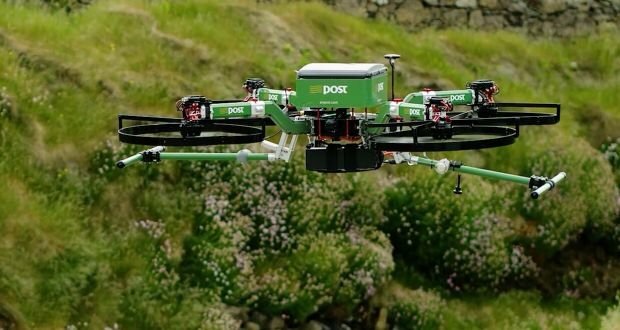 Following up on the postal drone delivery trials of SwissPost, Posti and SingPost, Australia Post’s CEO, Ahmed Fahour, confirmed that they are aiming for a 2016 parcel delivery drone trial with a major e-tailer (electronic retailer) who would like to deliver to regional and rural communities in Australia. According to Mr. Fahour, their test drone meets all regulatory flying requirements, has backup engines, and GPS coordination capabilities to deliver packages “right to the customer’s patios”. Each drone would be able to carry a 2 kg (4.4 lb) payload and would cost around AU$10,000 (US$ 7,200). 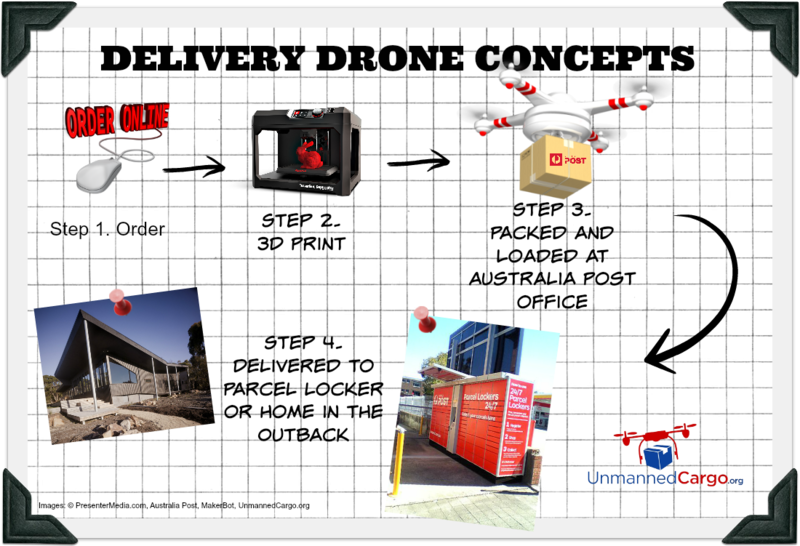 With their potential plans to have 3D printers at their post office locations and the expansion of their parcel pick-up lockers services in addition to the establishment of regular delivery drone services, Australia Post hopes to expand its horizons as a response to the ever growing decline of the letter delivery business which was highlighted by the 207 year old postal delivery service’s first financial loss in 30 years. From a personal perspective, one could imagine ordering a product online, having it 3D printed at the local post office and then having it loaded onto a delivery drone for either home or parcel locker delivery. Hopefully, the entrepreneurs selected to participate in the AU$20 million (US$ 14 million) innovation capital fund recently launched by Australia Post in conjunction with the University of Melbourne can make this a reality as part of the Accelerator Program’s quest to develop “tangible commercial venture opportunities in the eCommerce market”. Not yet defined. It will take some time to determine what type of drone is best suitable for the rugged Australian outback. Only parcels under 2 kg (4.4 lb). However, there are discussions to perhaps develop drones with a 10 kg (22 lb) payload. At max, a 25 kilometers (15.5 miles) route over rural areas within the visual line of sight of operators and at a maximum height of 122 meters (400 feet) as per Australia’s Civil Aviation Safety Authority’s (CASA) regulations to limit drone deliveries in open airspace. Possibly up to 75 kph (46.6 mph) as per this Herald Sun article. What are your thoughts on this new mail delivery drone trial down under? Comment below!